I like that the fastest connectors currently available for consumers (minus Thunderbolt) are all on one drive. Though most Mac users probably won’t use eSATA, and the d2’s USB 3.0 is hampered by Apple’s implementation of USB 2.0 on its Macs. But the d2’s connectors essentially future-proof the drive—you get fast transfer speeds now or later. They are also handy if you plan to share the drive with different computers. The d2 looks like a corrugated metal roof panel wrapped around a hard drive. On the front is a big, blue ball that glows while the drive is active (it’s like a blue version of HAL 9000). The ports, ventilation holes, power switch, and power input are on the back of the d2. Along with the drive, you get a power adapter, quick install guide, and a three-year limited warranty. It also comes with all the connection cables, except a FireWire 800 to FireWire 400 cable; LaCie sells one for $13, but you can find a cable for less online. The d2 can be placed on its side or stacked. 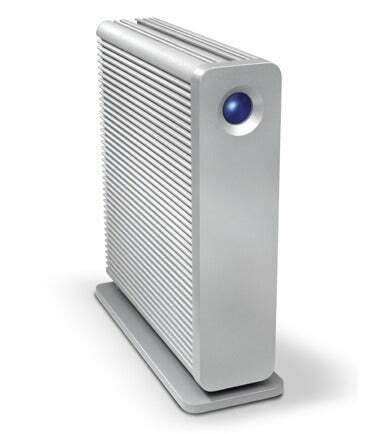 To use the drive vertically, LaCie provides a stand. With a provided hex key, you loosen screws on the stand, slide it in, and use the key to secure it. It would have been easier if LaCie had designed the stand so that it could just slide into the drive, but instead, you must use a key that could end up lost or misplaced. The LaCie Setup Assistant, an app that comes preloaded on the drive, greets you when you first plug the d2 into a Mac’s USB 2.0 or FireWire 800 port. The software helps you format for either Mac only use or use with a Mac and PC. The software then allows you to register the drive, and install the bundled software, Intego Backup Assistant and LaCie USB 3.0 drivers. Most people prefer to use OS X’s built-in tools to manage their hard drives. While LaCie provides an alternative with its Desktop Manger app, it isn’t really all that helpful. Sitting in the menu bar, it tells you the storage information of the drive, enables the blue activity light in the front as a shortcut button, and lets you set energy settings. You can just as easily check the storage information for the drive through the Finder, and trying to set energy settings through Desktop Manger just takes you to the Mac’s Energy Saver settings. About the only reason to use Desktop Manager is for the pushbutton shortcut. It gives you the choice of opening up a program or file when you push the d2’s blue button. It’s a neat feature, but it affects the transfer rates of your drive when you enable it (LaCie tells you so in the settings window), so you’re probably better off not using it. The speed results of the d2 were top notch. In the USB 2.0 Read Folder test (38.0MBps), USB 2.0 Read File test (39.8MBps), FireWire 800 Write Folder test (71.6MBps) and FireWire 800 Read File test (87.3MBps), the d2 bested every other drive we’ve tested so far. In other tests, the drive was quite competitive, coming close to matching the top speeds we’ve recorded. Note that we tested the drive without the blue button enabled. We also tested the drive using the LaCie USB 3.0 PCI Express Card ($50). We found the speeds to be just a hair faster than the drive’s FireWire 800 results. The exception was in the 2GB Read File Test, where it increased more than 17MBps, from 87.3MBps through FireWire 800 to 105.1MBps over USB 3.0. With lots of connection options and rapid transfer rates, the LaCie d2 Quadra USB 3.0 is easy to like. Its flaws are relatively minor and don’t detract from a great all-around drive.